For residential and many enterprise small cells, this can be almost any broadband internet service, including DSL and Cable. Sometimes mobile operators mandate that only their own fixed broadband service can be used with their residential small cells, but at least 50% don’t. The performance of the broadband link can affect the quality of service, but residential femtocells have been found to work with as little as 256kb/s broadband throughput. Sometimes, a benchmarking performance test is conducted during the online sale of a residential small cell, to ensure this will be adequate. In live operation, small cells monitor the bandwidth available and restrict their own capacity to handle calls where there is insufficient available – for example, limiting to one or two concurrent calls rather than multiple. For metrocells, deployed in streets and other public areas, a combination of wireless (for the last few hundred metres) and fibre seems ideal. A wide variety of technologies are being considered or adapted for this purpose, and we explain how a toolkit approach to metrocell backhaul is most likely. In particular, the last few hundred metres from a remote metrocell to the nearby hub will be a wireless link, and this (dubbed “fronthaul” or “streethaul”) has attracted the most attention. Why is Small Cell Backhaul needed? GSM, 3G and 4G operators and upcoming 5G networks are faced with exciting challenges – including extending networks to provide adequate connectivity in dense regions with a rapidly expanding user base. In rural areas the cells which comprise the network are relatively sparse – and frequently connected using microwave links. However, in urban areas the high density of GSM subscribers and radio propagation issues mean that “Microcells” are created – often to cover a small locality, building or an RF ‘blind spot’, connecting GSM Base Station Transceivers (BST) and Base Station Controllers (BSC), or 3G “NodeB” base stations. While take-up is slower than originally forecast, the cellular industry is beginning to show signs of densification through urban small cells. One of the constraints has been suitable backhaul, with fibre being strongly preferred but not universally available. Several wireless backhaul vendors have recently launched higher speed products. 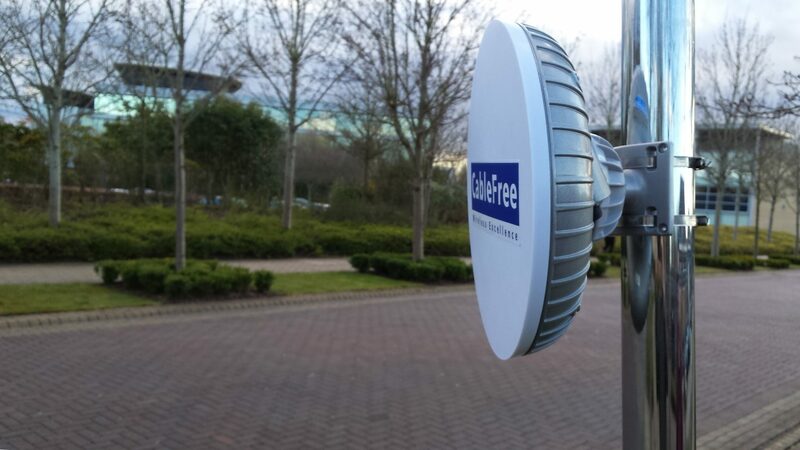 Throughput is a critical factor for adaptable and rapid urban small cell roll out. Traditional wired connectivity solutions for Small Cells use VDSL, ADSL+ links using copper wires or fibre optic links – but there can be drawbacks. Copper is slow and limited in reach, and often unreliable due to ageing plant, installed in a pre-broadband analogue era. In some areas fibre circuits are already available – but often patchy in availability – and sometimes impossible if proposed links are across a river, road or railway, or in a developing country where the existing telecommunications operator has limited or unreliable infrastructure. CableFree MMW offers up to 10Gbps or 20Gbps today. Free Space Optics (FSO) and Millimeter Wave (MMW) links can offer 1.25Gbps capacity, and Microwave solutions can offer up to 3Gbps capacity using latest-generation technology. Non-LOS MIMO radios in 2-6GHz band can be used as well. CPRI “Front Haul” Links can be achieved using Millimeter-Wave (MMW) and FSO with CPRI options for ultra-low-latency direct connection between Base Station Infrastructure and Remote Radio Heads (RRH).